You are going to Watch One Piece Episode 444 English dubbed online free episodes with HQ / high quality. Stream Anime One Piece Episode 444 Online English dub Even More Chaos! Here Comes Blackbeard Teach! 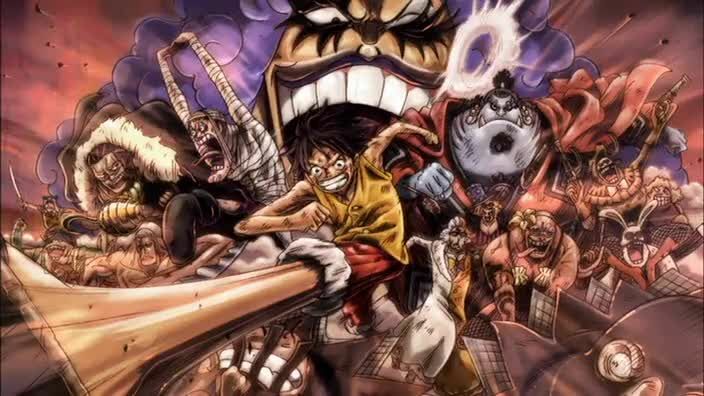 While Luffy and his allies continue fighting on Level 4, Buggy and Mr. 3 reach Level 2 and release the prisoners there to cause a riot to cover their escape. Meanwhile, Blackbeard arrives at the prison and begins attacking the guards to force his way in. Hannyabal, en route to Level 4, is overwhelmed by these developments until Magellan reveals that he has suppressed the riot on Level 2 and is releasing Shiryu to deal with Blackbeard. Shiryu, immediately after being released and given his sword, kills all the guards sent to release him.